Potato lovers will appreciate this vegetarian main dish from chef Cooper of Chicago’s Bite Cafe. The tots that form the base of the recipe are made from scratch; bunches of leafy fresh kale add the nutritional power of greens. 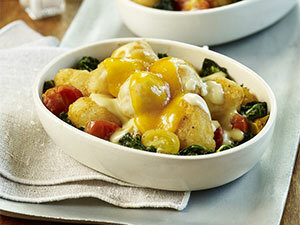 The dish is baked with a rich cheese sauce to tie the ingredients together. 1. For tots: In large saucepan, combine potatoes with enough water to cover. Bring to a boil over high heat; cook until tender. 2. Drain potatoes and cool to room temperature. When cool enough to handle, remove skins and place potatoes in mixing bowl. Gently crumble potatoes by hand. Add olive oil, salt and pepper; gently mix. Add potato starch to coat evenly. 3. Form mixture into 1-inch tots. Heat canola oil in deep fryer to 375 F. Fry tots until crisp and golden; drain. 4. For mornay sauce: In large saucepan over low heat, melt butter. Whisk in flour to form a roux. Add cream and bring to a simmer. Whisk in cheese until fully melted; stir in salt. (If sauce is too thick, thin with warm water.) Keep warm. 5. In saute pan over low heat, saute kale in olive oil until wilted and tender. Season to taste with salt and pepper. 6. Into each of six ramekins, place a few spoonfuls of kale. Add 4 tots on top; cover with about 3 tablespoons mornay sauce. Top each ramekin with a slice of cheddar. 7. Place ramekins in 350 F oven. Bake 15 minutes until cheese melts and ingredients are heated through.